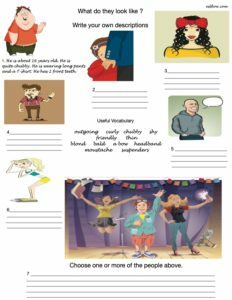 In this describing appearance writing exercise students use the vocabulary in the center of the worksheet or their own ideas to write descriptions of the people in the pictures. Click on the image or the link at the side to download the PDF file. 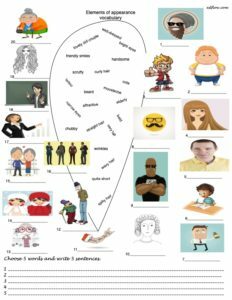 This is an English language exercise introducing and exploring the language and vocabulary for describing people. Students try to match the vocabulary with the appropriate pictures. vocabulary for describing appearance. Students sort the words into the appropriate columns. 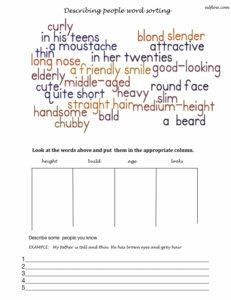 In this conversation or speaking exercise students practice creating a conversation describing someone’s appearance. They use the conversation skeleton below to create their own conversation. This could also be adapted to be a speaking activity. This is similar to the second exercise above but with different pictures. 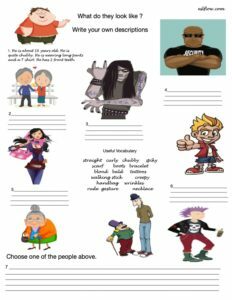 In this writing exercise students brainstorm information about a person they know well. 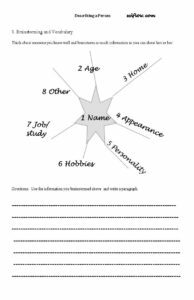 Then they write a more wholistic description of a person including appearance, personality and other aspects of his/her life. Very interesting, creative and useful activities. It will definitely be very handy for me for my lessons plans. Thanks for the comment. I really appreciate any positive or useful feedback. Thanks a million for your lessons. That help me teach my pupils easily.